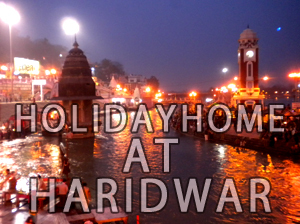 Haridwar is the gateway to the four pilgrimages of Uttarakhand. It is also the starting point on the journey to the sacred sources of the Ganga and the Yamuna Rivers. Associated with both Lord Shiva and Lord Vishn, Haridwar is among the seven sacred cities of India. According to legend, Prince Bhagirath performed penance here to salvage the souls of his ancestors who had perished due to Sage Kapila’s curse. The penance was answered and the river Ganga trickled for the from Lord Shiva’s locks and its bountiful water revived the sons of King Sagara. In the tradition of Bhagirath, devout Hindus stand in the sacred waters here, praying for the salvation of their ancestors. Haridwar is the kaleidoscope of blissful Indian culture and is also termed as ‘Gateways to Gods’; it is also known as Mayapuri, Kapila as well as Gangadwar. The followers of Lord Shiva (Har) and followers of Lord Vishnu (Hari) pronounce this place as Hardwar and Haridwar respectively. Area : 2360 sq. kms. Best Time to visit : This place is a unique round the year visible tourist destination. It is said that Yashodharman of Malwa (6th Century AD) known as King Vikramaditya constructed this sacred Ghat in memory of his brother Bhatrihari who is believed to have come to Haridwar to meditate on the banks of the Ganga. This ghat later came to be known as Har-Ki-Pauri (also called as the Brahamakund). At twilight, golden hues of floral diyas reflected in the river Ganga present the most enchangint sight. The imprint of Lord Hari’s footprint hallows the riverbank temple here. The ghat is regarded the most sacred and auspicious point to take holy dip in the Ganga during the 12 year Kumbh and the 6 year Ardh Kumbh. Every morning from 5 to 6 am, people join together for Aarti. Sprits soar and days are truly begun as people give thanks for this new day and for all are blessed with. Ganga Aarti is also performed at the time of Sunset. This divine light ceremony is filled with devotional song, prayer, ritual and a palpable sense of the divinity of Mother Ganga. The aarti, an ornate oil lamp, lined with dozens of flames burning in pure ghee is offered to God. According to legent the Saptarshi’s (seven sages) were deep in meditation here. The Ganga, not wanting to disturb them split herself into seven streams (Sapt Sarovar) around them. The temple of Goddess Mansa Devi is situated at the top of Bilwa Parwat. Here one statue of the goddess has three mouths and five arms, while the other statue has eight arms. The temple can be reached by trolley through ropeway (Cable Car) or on foot. The temple of Chandi Devi atop the Neel Parvat on the other bank of river Ganga was constructed in 1929 A.D. by the king of Kashmir Suchat Singh. It is a 3 kms trek from Chandighat. Legend has it that the goddess Chandi here killed the army chief Chanda-Munda of a local demon King Shumbh-Nishumbha after which the place got its name Chandi Devi. It is believed that Adi Shankaracharya established the main statue here in 8th century A.D. One can reach here by trolley through ropeway or on foot. Contact number of ‘Udan Khatola’ (Ropeway) is 01334-220324, Time – 8.30 A.M. to 6. P.M. It is situated on the Haridwar-Jwalapur bypass road. It is an old institution known for following a unique Gurukul system of education in India. The Ved Mandir Museum with archaecological exhibits in display can also be seen. Sati Kund, another well-known mythological heritage worth a visit is situated in the Kankhal. Legend has it that Sati self-immolated herself in this kund. Situated in Harihar Ashram, Kankhal, Shivling weighing about 150 kg and Rudraksha tree are the main attractions here. The tomb Piran Kaliyar of Shabir Shahib in Roorkee is a living example of religious harmony in India, which is visited by the prople of all religious sects from all over the world. ‘Urs’ festival is organized every year on the holy dargah in summer. Known as one of the Siddhepeeths, Maya Devi temple is an ancient temple that belongs to the Adhisthari deity of Haridwar. Said to be the places where the hearts and navel of Goddess Sati had fallen. The ancient temple of Daksha Mahadev is situated in the south Kankhal town. The mythological story about this place is that King Daksha Prajapati, father of Sati (Lord Shiva’s first wife) performed Yagnya at this place. Daksha Prajapati did not invite Lord Shiva and Sati felt insulted. Therefore she burnt herself in the Yagnya Kund. This incident provoked the disciples and followers of Mahadev who killed King Daksha, but later on Lord Mahadev brought him back to life. Daksha Mahadev temple is thus a tribute to this legend. This tank is at a distance of about 1 km from Har-Ki-Pauri. It is aid that while Pandavas were going to Himalayas through Haridwar, Bhim made this tank with the blow of his knee. Haridwar has several other beautifully made Ashrams/temples of significance such as ShantiKunj, Jairam Ashram, Bhuma Niketan, Bharat Mata Mandir, Vaishnav Devi Temple, Radha Krishan temple, Shravan Nath Math, Pawan Dham, Doodhadari temple, Bilkeshwar Mahadev temple, Shahi Gurudwara, Parmarth Ashram, Prem Nagar Ashram, Ma Anand Mai Ashram etc. All of these tourist places are worth seeing. The nearest Airport is Jollygrant, BhaniWala, Dehradun (41 kms). Air services are available from Delhi. Connected with all important Cities of India viz., Mumbai, Delhi, Agra, Kolkata (Howrah), Varanasi, Allahabad, Ujjain, Amritsar, Dehradun, Lucknow, etc. Haridwar on National Highway no. 45 is well connected to all major cities and other parts of the State viz. Local Transport Services : Private Bus servies, Tempo (Vikram), Auto Ricksaw, Tonga, Cycle-Ricksaw & Taxi. Haridwar is one place where fairs are being organized with full enthusiasm round th year, such as Somwati Amavasya, Kartik Poornima, Shravan Poornima, Ganga Dussehra and other important bathing dates of Hindu calendar. The kanwad mela during the month of Shravana is very popular among masses in which lakhs of devotees & followers of Lord Shiva comes to Haridwar to take holy water of river Ganga. The pilgrimage comes to an end on Mahashivratri. Apart from these, Purna Kumbh Mela and Ardh Kumbh Mela are also held at an interval of 12 and 6 years respectively. District administration has also organized ‘Haridwar Mahotsava’, a 3-4 day cultural festival on the bank of river Ganga and ‘Ayurveda Mahotsava’. Besides this ‘Urs’ is being organized annually at the holy dargah of Piran Kaliyar in which people of all sects participate and pray for their well being. Though all the Hindu festivals are celebrated here with pomp and gaiety, it is the Ardh Kumbh and Purna Kumbh Mela, which attracts large influx of tourists to this place for spiritual solace and rows. This Festival is held at Piran Kaliyar Sharif of Roorkee Tehsil in Haridwar District. In this Urs, Jaireens from within and outside the country come in lakhs. The Urs is of about on month, which is held according to the Muslim Calendar near Id-E-Milad. Ten days before Shivteras (during the months of Shravan & Phagun) thousands of devotees (known as Kanwadiyas) usually be barefoot throng to Haridwar & even upto Gaumukh, the source of holy river Ganga to collect holy waters of the river Ganga. Then they carry is back to their hometown and offer it at Shivlingam the local Lord Shiva temple. Colourful shops spring up and Haridwar resounds to the chanting of hymns. Vermillion powder or Sindoor, Brass Utensils for worship ;and sacred beads etc. Where to Shop: Moti Bazaar, Upper Road, Jwalapur, Bada Bazaar, Kankhal, Railway Road etc. This entry was posted on Tuesday, May 4th, 2010 at 9:27 pm	and is filed under General. You can follow any responses to this entry through the RSS 2.0 feed. You can leave a response, or trackback from your own site. Despite my background being a hindrance, I have always been fascinated by the story of Lord Shiva and this time when Amish Tripathi has come up with a book, the prankier and lighter side of Shiva is also pretty evident in the book and entertains us throughout. His attitude and charisma win over everyone, and so does the author with his sparkling narrative throughout the book. The twist in the tale comes when the average reader believes the battle between good and bad is won, and this twist has been handled brilliantly by Amish Tripathi. Just like me, you can also get the book at amazing prices and travel back to 1900 BC through http://www.uread.com/book/immortals-meluha-amish-tripathi/9788183860697. I am definitely bookmarking this blog and sharing it with my acquaintances. You will be getting plenty of visitors to your website from me! Best you should edit the page subject title Holidayhomeindia » Blog Archive » Haridwar to something more catching for your content you write. I enjoyed the blog post all the same. This is frequently a great blog site. I have currently been back a great number of occasions inside of the final 7 days and wish to sign up for the rss making use of Google . I need 3 rooms (seven adults & 3 children) on 17/10/2011 to 19/10/11,Please let me know the availability of rooms and rent per day and contact number of the person. Please get in touch with 9830788403 to know the latest availability of rooms. I need 3 rooms (Six adults & 1children) from 03/01/2015 at Haridwar Please let me know the availability of rooms and rent per day and contact number of the person.